It's a cold, rainy Sunday here in southcentral Pennsylvania. Perfect book weather! 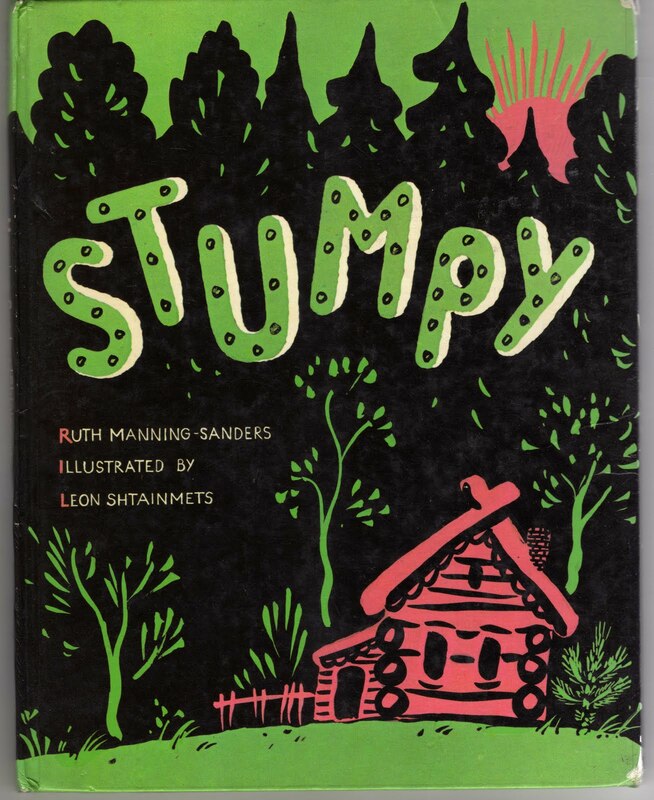 This is the cover of "Stumpy", a children's folk tale retold by Ruth Manning-Sanders in a 1974 hardcover published by Methuen Children's Books. It is illustrated by Leon Shtainmets. Stumpy is a short Russian tale1 that features Old Man, Old Woman, the mischievous Singing Bear, and some magic. Singing Bear has the ability to sing all living creatures to sleep, and he uses this power not for good, but so that he can commit misdeeds. Bear ties Old Woman to a tree stump2 (pictured at right) and heads back to the house for Old Man, who is still well hidden in a large apple basket. Old Woman, to protect herself, sings a magical song that causes the tree stump to grow far into the sky, taking her with it3. In the meantime, Singing Bear cannot find Old Man, but smells the apple basket and decides to have a snack instead. His jostling wakes Old Man, who gives out a yell that startles Singing Bear (who believes the basket has come alive), sending Singing Bear fleeing into the countryside. Old Man heads out to find Old Woman. After much searching, he discovers her high atop the tree stump. She sings again, and the stump magically lowers itself to its original height. He frees her, they kiss and they head home to live happily ever after. Meanwhile, the startled Singing Bear is still running and is never heard from again. 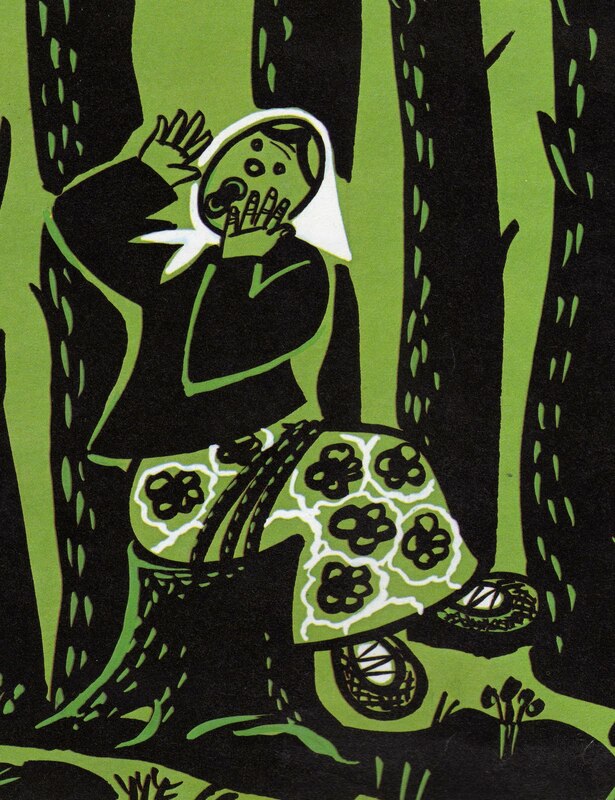 Interestingly, I found another Russian folk tale that involves a bear being fooled by a basket. It's called "Masha and the Bear"4. In this one, Old Man and Old Woman have a granddaughter, Masha, who is kidnapped by a bear. Eventually, she escapes by tricking the bear into delivering apple pies to Old Man and Old Woman in a basket that she has hidden herself in the bottom of. You can read the full story here. Clearly, baskets are an Achilles' heel for antagonist bears in Russian folk tales. Meanwhile, the coolest thing I read online this week was this entry on Unusual Life about a "fairy tale house" in Beverly Hills, California. It has to be seen to be believed. 1. Here is a partial list of other Russian folk tales retold by Manning-Sanders. 2. Looking at the illustration, I fail to see how she is "tied" to the tree stump. 3. And the raising of the tree stump far into the sky makes the idea of Old Woman being tied to it seem even more impossible. Yes, I'm the guy who thinks about things like that. 4. In a sign of the times, "Masha and the Bear" is now an iPhone cartoon series that has its own Facebook page.